In contrast to medication, Neurofeedback can be used as a treatment for adults and preschoolers alike. Through Neurofeedback, brain activity can be visualized and measured on a monitor. Neurofeedback training centers around game-like exercises on the computer. Just as patients have learned to walk or ride a bike, through Neurofeedback they internalize how they must behave in order to be attentive and relaxed. Neurofeedback reduces ADHD symptoms permanently, in contrast to medication. Scientific data has shown that the ability to enable oneself to pay attention remains even years after therapy ends. Writing samples impressively show impressively how neurofeedback can improve the performance of children: After 20 to 40 sessions, they are more concentrated, more relaxed, and more self-confident. Their handwriting often improves as well. Neurofeedback significantly and sustainably improves the behavior and the cognitive performances of those treated. That way, not only those affected, but also their families and those in their environment, can cope better with everyday life. Previously, people smiled at them and called them “fidgety” or “daydreamer”. Today, it is common knowledge that a persistent dysregulation of brain activity is associated with the behavior of many children and adults: the attention deficit hyperactivity disorder (ADHD). 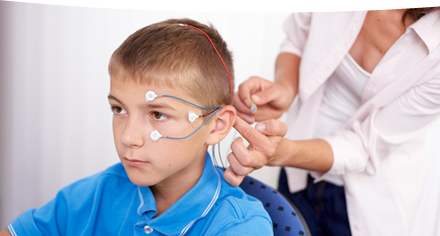 Neurofeedback is a gentle, non-pharmacological, and painless therapy used to successfully treat ADHD. Professionally carried out by psychotherapists, child and adolescent psychiatrists or occupational therapists, Neurofeedback not only reduces the symptoms, but it also tackles the fundamental causes of the disease. People who are affected learn to recognize and control their brain activity permanently. The following pages introduce Neurofeedback as a method of therapy. The earlier children and adults are treated, the better they and their families can learn to live with this challenge and to manage their everyday lives. Das Magazin GEO Wissen Gesundheit greift in der April-Ausgabe das Thema Neurofeedback als Methode zur Selbstheilung auf.